Do you remember the 1960s and ’70s, when Disney would erect an enormous star atop the Matterhorn each year during the holiday season? Me neither—because I wasn’t born then. 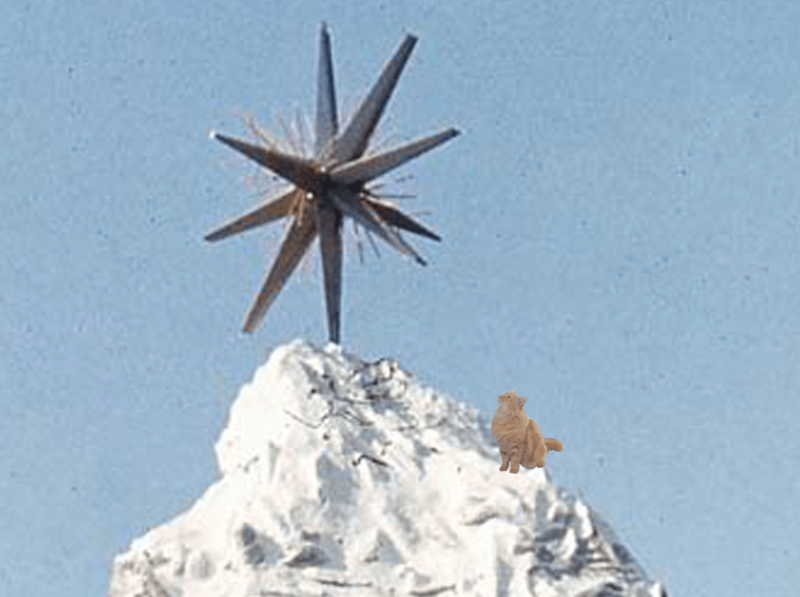 But I was able to find a picture of one of my orange cat ancestors who had scaled the Matterhorn to gaze up at the star. Happy Throwback Thursday! Of course, the Matterhorn has long been one of my favorite attractions to hang out inside. Not only do we play our annual March Meowness tournament on the basketball court, but I can never get enough of lounging around alongside the track and meowing ominously (the acoustics in there are great, and I can really freak out groups of unsuspecting humans). You might think that I would be scared of Harold, the snowman, but he’s actually not so bad once you get him to stop flashing his red eyes and menacingly waving his arms. I once had a great discussion with him about literature. As it turns out, he is not at all well-read. As for the Matterhorn during the holidays, certain Imagineers keep hinting that the star may make a return someday. Until that particular Christmas season comes, however, I’ll just have to take on the role myself—because you’re crazy if you don’t think there’s a star atop the mountain when I decide to grace it with my presence.